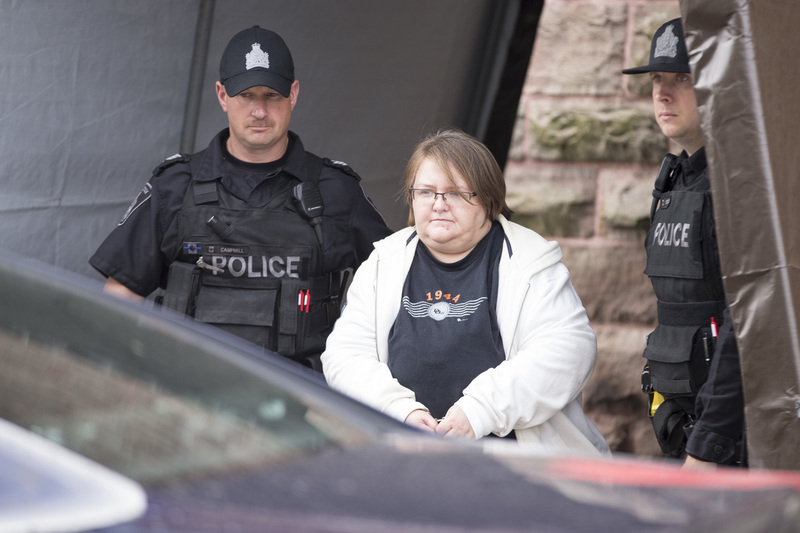 In Canada, Ex-Nurse Pleads Guilty To Murdering 8 Nursing Home Patients : The Two-Way Elizabeth Wettlaufer's guilty plea makes her one of the deadliest serial killers in the country's history, according to Canadian media reports. She says she injected her victims with insulin. Elizabeth Wettlaufer pleaded guilty to the murder of eight elderly patients in Ontario, Canada. A Canadian former nurse has pleaded guilty to the first-degree murder of eight elderly nursing home patients in Ontario, making her one of the deadliest serial killers in the country's history. Elizabeth Wettlaufer also pleaded guilty to four separate counts of attempted murder and two counts of aggravated assault, according to Canadian media reports. "Wettlaufer stood up straight and spoke clearly and concisely as she pleaded guilty to the charges. "She confirmed that she was not intoxicated by drugs or alcohol while injecting the victims with insulin with the intent to kill.
" 'You knew this could be fatal?' Thomas asked Wettlaufer.
" 'Yes, your honour,' she answered." "Wettlaufer lived in the town of Woodstock, Ontario. Seven of the patients also lived there, at the Caressant Care long-term home, according to police. The eighth patient was a resident at the Meadow Park nursing home in nearby London. "The first victim, 84-year-old James Silcox, died in August 2007, while the most recent victim, 75-year-old Arpad Horvath, died in August 2014. The three men and five women ranged in age from 75 to 96." "James Silcox, 84, a Second World War veteran, who died on Aug. 12, 2007. "Maurice (Moe) Granat, 84, a tinkerer and handyman, who died in December, 2007. "Gladys Millard, 87, who died on Oct. 14, 2011. She was a long-time member of Knox Presbyterian Church in Woodstock as well as other community groups. "Former schoolteacher Helen Matheson, 95, who died on Oct. 27, 2011. "Mary Zurawinski, who died on Nov. 7, 2011, was the oldest victim. She was 96. "Edinburgh-born Helen Young, was 90 when she died on Sunday, July 14, 2013. She had served in the Royal Air Force during the Second World War then came to Canada as a war bride. "Maureen Pickering, 78, who had been a dedicated caregiver for her ailing husband, died on March 28, 2014. "Arpad Horvath, 75, who died Aug. 31, 2014, came to Canada after the Hungarian revolution and ran a tool and die company in London." Wettlaufer has struggled with addiction and mental health issues, the Globe and Mail reported. And the Toronto Star reports that testimony in court described how Wettlaufer "felt 'anger and pressure' building inside her" before she injected Silcox with insulin. She told the court about how she felt "overwhelmingly angry" about her life. Some of the victims' families, such as Silcox's daughter Andrea, said that they were relieved that Wettlaufer's guilty plea would likely speed up the trial. "I will forgive her, I have to forgive her ... my father would want that," Silcox told The Associated Press. "Forget? I'll never forget what happened." The Star reports that "convictions for first degree murder carry an automatic life sentence, with no parole eligibility for 25 years."